New Jersey sponsors one of the period rooms in Memorial Continental Hall, at NSDAR Headquarters in Washington, DC. 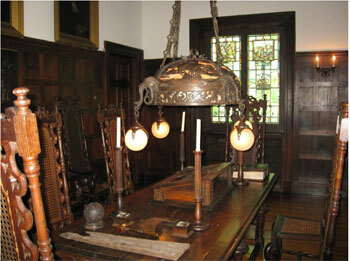 The New Jersey Room was installed prior to 1911, and is modeled on an ancient room from the City of London. The paneling and furniture for the room were carved from oak timbers salvaged from the British ship Augusta, which sank during the Battle of Red Bank on October 23, 1777. The room also contains portraits of the five New Jersey signers of the Declaration of Independence. Stained glass windows contain illustrations depicting scenes from New Jersey at the time of the American Revolution: the tea burning at Greenwich; the Indian King Tavern at Haddonfield; the Engagement at Chestnut Neck; the Skirmish at Quinton Bridge; the Battle of Red Bank; the Whitall House; Fort Mercer; the story of Molly Pitcher; Old Tennent Church; the Old Well in Parsippany; Camp Middlebrook; the Battle of Monmouth; Washington's Headquarters in Morristown; the Battle of Trenton; the Wallace House in Somerville; and the Battle of Princeton.